Joe Sinnott is a true living legend. During his 56-plus-year career in comic books, he has worked in every genre, and for almost every publisher. As a young artist in the 1940s, he started with Stan Lee at Timely Comics, then branched off to Charlton Comics, Treasure Chest, and Dell as a top penciler. 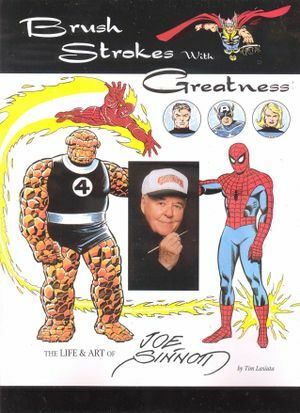 But the creation of the Fantastic Four in 1961 by Stan and Jack Kirby ushered in the Marvel Age of Comics, and Joe began a long and storied association with Marvel as its top inker. His deft touch can be seen on almost every book published by Marvel in the ’60s to the late 1980s, and today, Stan and Joe continue that tradition with the Sunday Spider-Man comic strip. Brush Strokes With Greatness celebrates the storybook career of the versatile artist, as he demonstrates his passion for his craft. In it, Joe shares his experiences working on Marvel's leading titles, memories of working with Lee and Kirby, and rare and unpublished artwork from his personal files. This book features dozens of colleagues and co-workers paying tribute to Joe and his amazing body of work, plus an extended Art Gallery, and a Checklist of Joe's career. Don't miss this once-in-a-lifetime celebration of all things Sinnott, which includes a Foreword by Stan Lee, and an Afterword by Mark Evanier. Siden blev sidst ændret kl. 19:40, 24. august 2018.